Mailutils is a swiss army knife of electronic mail handling. It offers a rich set of utilities and daemons for processing e-mail. 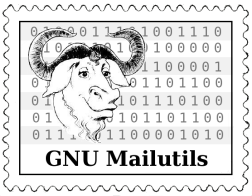 All Mailutils programs are able to operate on mailboxes of any existing format, ranging from standard UNIX maildrops, through maildir and up to remote mailboxes, which are transparently accessed using IMAP4, POP3 and SMTP. Mailutils is oriented toward three kinds of audiences: regular users, system administrators, and developers of email-handling software. Regular users will find here an implementation of the traditional UNIX mail reader mail, command line utilities, such as frm, messages, readmsg, and sieve -- a flexible utility for filtering the incoming mail. A special feature of Mailutils is an implementation of the MH Message Handling System, which combines a power of the UNIX philosophy with a flexibility of Mailutils libraries, thus allowing to easily incorporate mail from remote mailboxes. For system administrators, Mailutils provides a set of daemons for delivering and reading electronic mail, including pop3d, imap4d and a universal mail delivery agent, called maidag. Some utilities are of equal interest for both audiences. One of them is movemail, which owes its name to a program from GNU Emacs distribution, but provides a much richer set of possibilities than its predecessor. The Mailutils movemail is a full-fledged mail retrieval agent which can easily be used to fetch mail from remote servers. At the same time it is also a multi-purpose tool for converting mail storages between various mailbox formats, which will be of particular interest for system administrators. Finally for software developers Mailutils offers a set of libraries for doing almost any mail-related task on any existing mailbox format, and all that using a consistent, format-independent, interface. The core part of this is libmailutils, a library which provides access to various mailboxes and protocols, such as: UNIX mailbox, Maildir, MH, POP3, IMAP4, Sendmail, SMTP. It and other libraries contain functions for a wide variety of tasks, such as parsing of messages, email addresses and URLs, handling MIME messages, listing mail folders, mailcap facilities, extensible Sieve filtering, access control lists and many more. It supports various modern data security and authentication techniques: TLS encryption, SASL and GSSAPI, to name a few. The framework is able to work with a wide variety of authorization databases, ranging from traditional system password database up to RADIUS, SQL and LDAP.